News - Jessie J: Tour clothes are tiny! Jessie J: Tour clothes are tiny! The It's My Party singer admitted that she doesn't need a trolley-load of luggage and bags to contain all her figure-hugging and clingy costumes. "It's all just ripped trousers and knickers! I like to travel light," she quipped. "Some of the stage outfits I've got are ridiculous. I'll lay out clothes to pack, and it'll look like Polly Pocket clothing - because it's all stretchy, it's tiny. I don't need a case when I tour, I can fit it all in my handbag." 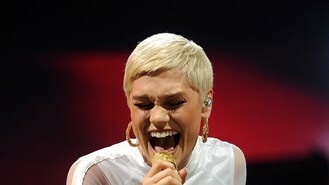 Jessie - born Jessica Ellen Cornish - has enjoyed a phenomenal run of success, since her 2010 debut single. As she releases her second album Alive, the former Voice judge said she is more in control of her career now. "I know what I'm doing that bit more. I feel like I'm in control and prepared, rather than just turning up. I know how I want to represent myself, what to wear and all that," said the 25-year-old. She said the more successful she became, the more people tried to tell her they were responsible for it, and the more they wanted an input on what she did next. "Before I was successful, someone might not be bothered. Now, they all want to get their little spoon in the glory pie," she said. Jessie wants her critics to "grow up" in new single It's My Party, directed at Twitter trolls who spend their time sending her abusive messages. "There were all these messages coming in (on Twitter), like 'I hate you', 'I want to kill you', or 'You're ugly', and I just thought about how negative people are. But I'll do what I want. It's my party."